LEXINGTON, Ky. (Sept. 23, 2011) -- Like turning 21 or 30, turning 50 is one of those “special” birthdays — a mile marker, a big deal. If you doubt that assertion, just go online or visit the local party supply store and check out all the “Oh, NO, the Big Five-Oh” birthday party decorations. Much of it will be black — black balloons, black coffin-shaped candy dishes, black candles. T-shirts and cards offer a list of how and why your life is either 1) over and done or 2) just beginning (just kidding). 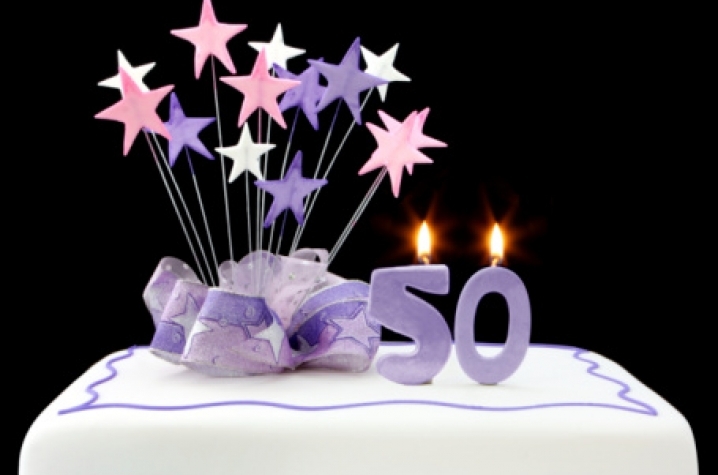 There will be a selection of “You know you’re 50 when…” lists that predict horrific changes to one’s body and mind. That nifty-50 perspective is the one University of Kentucky Dining Services has adopted to celebrate the 50th “birthday party” of its oldest eatery on campus, K-Lair Grill. The celebration — with free hamburgers and birthday cake — is 2 to 3 p.m. Friday, Sept. 23. Despite the 50th birthday, don't think of the campus landmark as "old." As a matter of fact, alumni returning to campus may not even recognize the more youthful looking diner. For one thing, the place has a more hip name — just call it the K Lair now. And the grand old lady got a face-lift — a $40,000 renovation including new wooden flooring, a complete paint job in contemporary colors, brighter lighting, pleasing artwork, new countertops, easy-to-read menu boards, and inviting tables and chairs. She’s serving fresher, lighter food, too updated salads, fresh vegetables, chicken sandwiches and turkey burgers.